Christmas is all about traditions. My quilting Christmas tradition is my annual Fabric is Better Than Food Brunch held at my home each December. 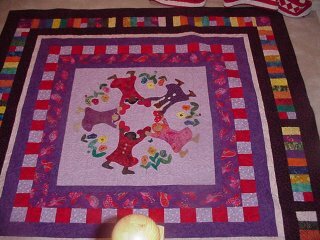 This tradition began after a group of eight quilters took a year long class to learn to make a quilt called Mother Earth in 1999. As the end of the class drew near, we became nostalgic and knew that we would really miss seeing each other. I proposed that we gather at my house for brunch and do a Show-and-Tell of our Mother Earth quilts. And so a tradition was born. Every year we gather for the much anticipated Fabric is Better Than Food Brunch and the good times roll. One member selects either a pattern or a challenge fabric for the upcoming year. The finished quilt is brought back the next year. Show and tell is fabulous, but the conversation! Ohmigod! I know the ears of every black man in American are burning during the brunch. Naturally, they are our favorite topic and my famous mimosas do loosen tongues. But back to the quilts. The 2005 quilt had to contain red hat fabric that was distributed at last year’s brunch. As usual, the creativity was amazing! My quilt shown here is called Forever Young. Others are posted above. Wondering about the food at that first brunch? It was simple. I made them cook!